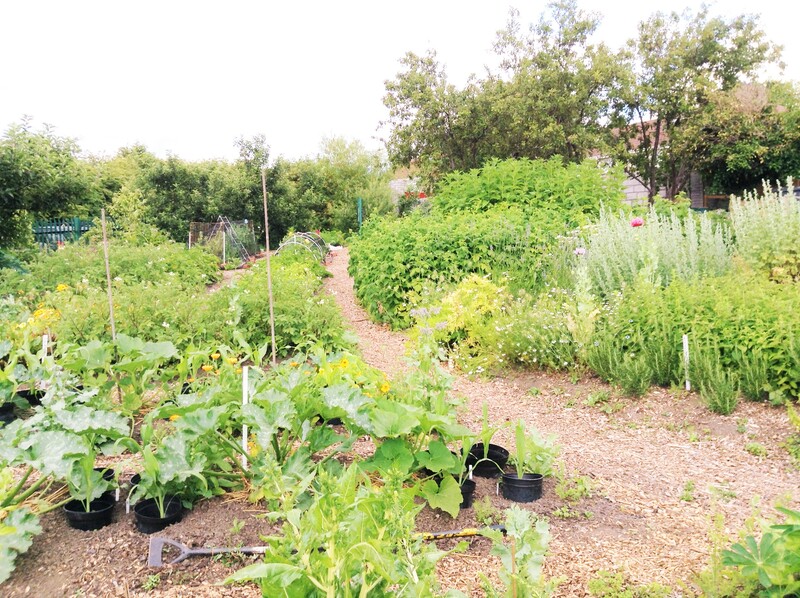 Most people interested in practicing permaculture are doing so in a domestic situation – a house or apartment with a garden or in a community garden space. Here are some of the most distinctive permaculture gardening methods you can adopt for a healthy, low-maintenance and highly productive garden on any scale. Soil is the very foundation of life on our planet, and we need to understand how to take care of it so that it can support the plant life which feeds us. The soil food web is complex and fragile and about the most damaging thing we can do to it is regularly turn it over, break it up and squash it. Traditionally we dig in order to relieve compaction, create a fine tilth for sowing into, incorporating fertilisers and removing weeds. There are various ways in which we can avoid the necessity for routinely digging, so not only do we save the soil, but we save a lot of energy too. Raised bed gardening is a wonderfully simple way to garden without digging. The growing area is divided into permanent beds made to the right size for the gardener, ie. The middle of the bed can easily be reached from the paths. Topsoil is then rescued from the paths and added to the top of the raised beds which are also generously composted. This creates a slightly mounded effect, hence the name. Raised beds don’t necessarily have solid sides, although some people choose to create them to keep grass out, raise the veg above the reach of rabbits and white fly, or to make them easier to reach for people with limited movement. The beds have a lovely deep, rich topsoil which can support a higher density of crops, so planting distances can be closer. This makes raised beds very productive, and especially well-suited to growing polycultures (more on this below). When it comes to harvesting root vegetables, you may not even need to dig them out, the soil is often so soft and friable that they pull out easily. Compost is added to the top of the beds each year and, as in nature, the soil life incorporates it from the surface down and converts it into plant food. Digging has its place of course. It may be necessary to dig initially, perhaps for a couple of years if soil is very compacted or devoid of organic matter. The ideal is to get the soil in to a condition that can become fertile, then allow the soil life to move in. Without the worms and micro-organisms, the soil is dead and the only way to grow plants is to use chemical fertilisers. These creatures live and feed on organic matter – they are what turns your kitchen scraps into compost. When you add compost you are adding life, and the soil life feeds the plants. 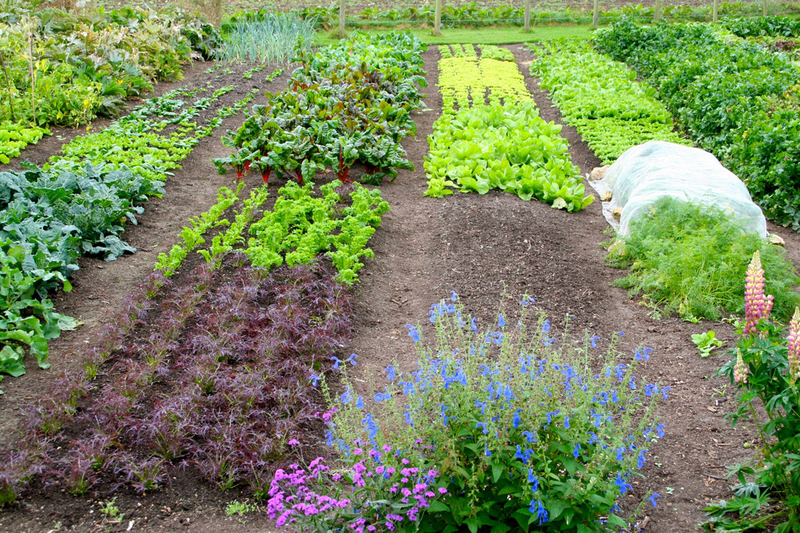 A polyculture is the opposite of a monoculture, it means growing more than one kind of crop in the same space. This could be as simple as growing salads in the gaps between cabbages, or as complex as a 2-acre forest garden. Picture a huge wheat field -that’s a monoculture. A whole bed of broccoli is also a monoculture. When club root bacteria encounter a whole bed of brassicas (the cabbage family plants) they have a field day and procreate like mad, causing the grower a serious problem. Pests and diseases tend to be species-specific, that is they have one particular plant they are looking for. In nature they have to work hard to find their prey, but our gardens are like an all-you-can-eat buffet. This is why traditionally we rotate families of crops around different growing areas to avoid these pathogens building up. A polyculture mimics nature and makes pathogens look harder for their chosen plant, and when they find one they don’t find them all. There are many other advantages to mixing up our crops. From observing nature, we can see how plants live together by being different – different sizes and shapes; light, nutrient and water requirements; growing speed and harvesting times. Diversity makes optimum use of the available resources; every niche is filled with life. A cabbage takes a long time to grow from a small seedling to a large, round fully-formed cabbage, and in the meantime the soil around it is bare and unproductive. It never stays bare for long as there are seeds everywhere waiting to move in. The seed bank which accumulates in the soil from air born seed or those dropped by surrounding plants can be gradually buried over time by not digging and adding compost and mulches to the top of the soil, but there are always more seeds blowing in, so the soil needs to be covered, ideally with useful plants. If a weed can occupy the space between your vegetables, you could be growing another vegetable there. By being different, crops can create beneficial conditions for one another, like lettuces under purple sprouting broccoli for example – the lettuces will benefit from a little shade in the summer months. Fast growing crops like radish can be broadcast beneath slower crops to make use of the space and protect the soil, or to show you where you have sown slow-germinating crops like parsnips, so they don’t accidentally get hoed. Peas and beans can support the growth of green, leafy veg and hungry crops like pumpkins by adding nitrogen to the soil. Through experimentation in our gardens we can find groups or guilds of plants which grow very well together. By filling our beds with produce we have less weeding to do and more veg to eat. But of course, we need to replace what we take out and growing this intensively means we need to ensure we have plenty of compost to replenish the beds each season. A barrier to weeds – to kill or supress existing weeds, and to prevent seed from germinating and colonising. Mulches may take the form of black plastic or weed-stop fabric if the purpose it simply to keep weeds out or clear new ground for growing. It could also be organic materials like layers of cardboard, manure and straw. 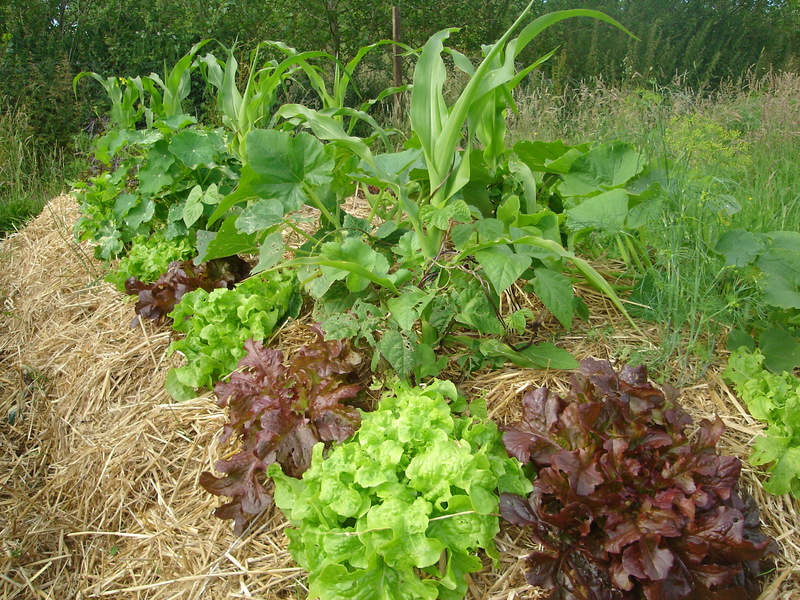 In an established growing space, it could be straw placed around crops while they grow to keep out the weeds, or compost added to raised beds to bury weeds seeds and add fertility. It is best to work with the materials you have, either in your own garden, or locally. 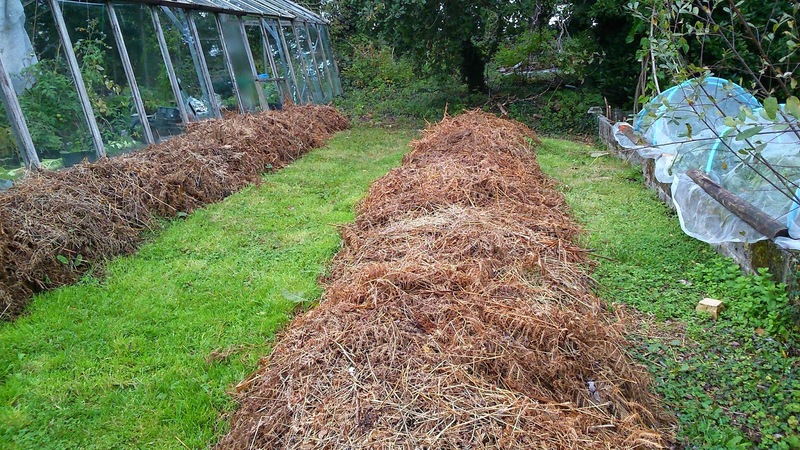 In gardens make use of the bulky winter die-back on herbaceous perennials like bracken, Montbretia or flag iris. In towns and cities, you may be able to get hold of wood chips from the council or local tree surgeons. The principles of permaculture come from observing eco-systems and many of the gardening methods we recommend mimic nature in order to increase the general health of our own little eco-systems – our gardens. If we take good care of them, they will take good care of us. The Land Course Online is an affordable online permaculture course with five modules to choose from: Soil, Ecology, Organic Horticulture, Sustainable Forestry, and a fully certified Permaculture Design Course. Caroline Aitken teaches two residential weekend courses on Kitchen Gardening at The Sustainability Centre in Hampshire each year. See our course diary for dates and content.